100% Rest & Privacy, enjoy a FENOMENAL 180 ° Sea and Mountain View !!! Private Saltwater Pool, 4 Bedrooms, 2 Bdk, Air conditioning, Free WiFi, Free Parking. Looking for a place to "relax" and "de-stress"?!? 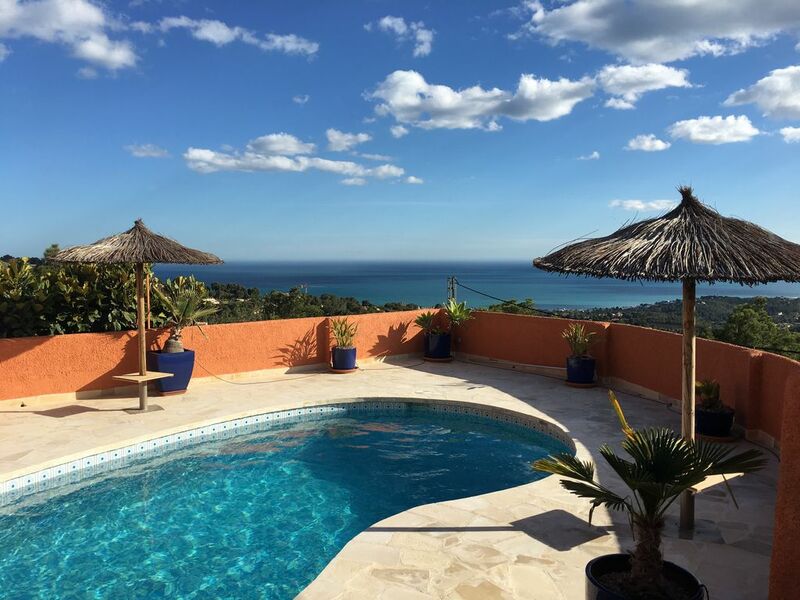 It is possible in this beautiful villa with all-round views of the clear blue Mediterranean Sea and the mountains. Here you can fully enjoy the sun! This villa is cozy and tastefully decorated. The magnificent sun terrace with a saltwater swimming pool is all day in the sun and is equipped with 8 lounge chairs, 2 tropical parasols and a shade sail. There is a ping-pong table on the patio. As a holidaymaker you can enjoy a beautiful terrace with a comfortable lounge seating, BBQ and a large outdoor kitchen with bar. The villa is equipped with a fully equipped kitchen (induction hob, hood, combi-oven, dishwasher, microwave, coffee machine, kettle, toaster, large fridge and washing machine). Adjacent a naya with sliding windows that spend on the pool terrace, equipped with a dining table that seats 8pers. Along here you also have access to a second naya with sash windows on the pool terrace. This was furnished as a lounge corner with a large glass door fridge and an American Pool table. Furthermore, you will also find 8 people in a large living- dining room. with inner bar and zitbuil. This space is equipped with air conditioning C / W, flat Sat. T. V. and D. V.D. player. The villa has 4 bedrooms and 2 bathrooms. 3 bedrooms and 1 bathroom are on the ground floor, 1 bedroom with ensuit bathroom is located on the first floor, accessible via a staircase. cupboards and air conditioning C / W.
Slpkmr 3: small room with bunk bed 2x 0. 90 x 2. 0, large fan. The villa is located just 3km from the A7 motorway. Peace & privacy everywhere, no insight (last villa in dead end street). It lies at an altitude of 240m, accessible via a country road that treats you on spectacular views. A car is a must here. Closest village Altea la Vella 2km where really everything is in hand, from bank, pharmacy, bakery, supermarkets, hairdresser, restaurants, pizzerias, bars, ice cream parlor, newspaper trade, you name it. !!! * REQUIRED * TO PAY ON THE SPOT * !!! * 130 € Final cleaning * Required rent bed-, bath- & kitchen linen package / pers. /residence: The beds are made on arrival. 1Gr Towel - 2 Kl Towels & 1 Beach Towel. 1 Tea towel - 1 Tea towel & 1 Dish cloth. * Optional rental Baby package: Baby cot with mosquito net & sheet package. High chair. Cape Towel & Beach Towel. (2 packages in stock) 1 Baby Safety Pool. Urlaub wie es sein soll, grossartige Lage, tolle Aussicht! Wir haben die Villa La Morada zu fünft (4 Erwachsene, 1 Kind) bewohnt und es war ein grossartiger Aufenthalt! Das Haus ist ausreichend groß und es gibt vor allem im Aussenbereich genug Platz (Liegen, Tische, Lounge, Bar, etc.). Die Aussicht ist fantastisch und zwar nicht nur in Richtung Meer, Altea, Benidorm, sondern auch nach hinten wo sich direkt der Berg auftürmt über den in der Früh die Wolken dahin ziehen. Alles sehr schön ;-) Es ist schwierig, etwas Negatives über dieses Haus zu sagen, ein paar Dinge finden sich dann doch: Das Schlafzimmer mit dem Stockbett haben wir nicht benützt und darüber sind wir sehr froh, das ist eher eine Abstellkammer als ein Zimmer - sogar unsere 6 jährige Tochter fand dieses Zimmer zu klein/beengend. Sollte man berücksichtigen, wenn man das 7. und 8. Bett braucht. Wem, wie uns, drei Doppelbetten reichen, dem kann das egal sein. Der Griller/BBQ ist als grenzwertig zu bezeichnen, viel zu klein für 5-8 Personen und auch qualitativ nicht gut. Ein großer Weber-BBQ oder ein gemauerter Griller würden besser zur ansonsten sehr hochwertigen Ausstattung passen und auch ermöglichen, dass man wirklich eine Mahlzeit für 5-8 Personen darauf zubereiten kann, der vorhandene Griller eignet sich eher zum Würstel braten für die Kids. Letztlich als letzter Nachteil sei noch genannt, dass das grosse Schlafzimmer kein Fenster nach draussen hat! Die Fenster gehen in den Billard-Raum (der übrigens super ist ;-), dh. Frischluft und Licht kommen in dieses Zimmer nicht wirklich gut ... Aber man hält sich ohnehin nicht viel dort auf und wegen der Temperatur hatten wir auch jede Nacht die aircon laufen, war also nicht sehr schlimm. Insgesamt ein super Haus in exklusiver Lage, Vermieter Sabine und John sowie Key Manager Russel auch sehr nett und hilfsbereit, wir werden wohl wieder kommen!! REPOSANT & TRES CONFORTABLE !!! Nous avons passé avec les enfants une très belle semaine de vacances. La maison a été idéale pour nous 5. Nous avons apprécié la décoration raffinée et soignée de chaque pièce, également bravo pour les terrasses et jardins extérieurs. Bien entendu, quelle vue extraordinaire ! Villa idéale pour passer une semaine de vacances au calme. Très bonne communication avec le propriétaire et avec les personnes qui nous ont accueillis. Cher Fabienne Ludovic, Raphaël, Zoé & Clément. Vous étiez vraiment des super locataires merci !!! Il est toujours agréable de lire que nos invités ont apprécié les changements que nous avons apportés et le travail effectué sur place par nos responsables des clés. C'est le but et l'engagement de chacun, de vous donner des vacances sans soucis et si tel est le cas, c'est le meilleur compliment pour nous! Maison très agréable, vue absolument magnifique . Nous n avons manqué de rien !! Tout était parfait , résidence très propre. A répondu à toutes nos attentes ! Cela nous fait beaucoup de plaisir, nous partageons certainement cela avec nos gestionnaires de clés. Vous étiez des super locataires, espérons vous revoir!!! Sabine - John & Team "La Morada"